Our family kept getting sick because we have three children in public schools. We didn't want to use flammable products on them or give them that stuff to take to school. We found PureWorks by accident and are so grateful. We have the kids use it at school and before they come home and we haven't been sick since. I really think that these products are the reason for our health. Nothing else has changed. I wouldn't go a day without it. Our whole family uses PureWorks everyday, even our grandchildren ask for it. We love the way it makes our skin feel soft and we are all grateful for the peace of mind knowing that we are protected. Our entire family loves these products and hopes to never be without them. Thank you PureWorks! I love your lotion. I haven't been much for lotion over the years, but PureWorks is great stuff. It feels good when I apply it. Moreover, it's comforting to know that I'm protected by the best hand sanitizer in the world. Honestly, I love the stuff. I have been especially drawn to the PureWorks products because of my children. I have a 5 year-old boy, a 4 year-old girl and a 2 year-old girl. We started out using the foam on our hands and loved the simple way it was applied, the way it made our skin feel and that fact that my children were protected for a longer period of time than other products we had used. My children and I then started to see other uses for what we call the "bubbles". I started using it on cuts, scrapes, dry and chapped skin. Now, anytime there is something that hurts, we use the "bubbles". If we are out and about, we use the "bubbles". Every time we get in the car or come in the house, we use the "bubbles". Even friends now ask us for the "bubbles". We have loved using this product and have been so excited to turn that love into a business where we can share with others how they too can use the "bubbles". My daughter, age 13, is a 7th grader in junior high school. Like many people, she has a constant feeling of chalky feeling hands. She uses the Pureworks foam all day long at school, and keeps some in her back pack and locker. She says it is the only thing that helps her with this condition. She will not use anything else and is very happy that I have a supply to provide to her. I am a diabetic and have had an open wound on my leg for several years, It simply will not heal. I have been to the doctor several times and he had me try several things but nothing worked. I started putting PureWorks on it to help it heal. After about 3 weeks it was completely healed. My doctor couldn't believe it and now gives PureWorks to his patience who have wounds like mine. He told me that this product has saved my leg and kept it from having to be amputated. You might say I LOVE this product. I was going through chemo during a bout with cancer. I was so weak that I couldn't afford to get sick. I started using Pureworks during flu season and even though several members of my family got sick I still didn't. I am convinced that I didn't get sick because I was using PureWorks. I never once got sick during the chemo...Thanks PureWorks!" A friend and his daughter came to visit me and they used the PureWorks soap. After commenting on the gentle nature of the soap, his daughter wanted to buy some from me, It caught me off guard, because I wasn't used to selling the product to people. I asked her what she wanted it for. Without hesitation she replied, that the other soaps she had were very drying and she wanted to use it to clean the make-up off of her face. She pulled cash out of her purse, and I gave her a bottle! I have been using PureWorks products now for about three months. The product is the best I have ever used. As a former Operating Room/Surgical Technician and paramedic, I know that taking care of your skin is essential. I simply use it as a routine part of my hygiene and health maintenance program. PureWorks products allow me to keep my skin in excellent condition. In the past, both mine and my children's hands have been cracked and bleeding from alcohol-based products and antibacterial soaps. This is not the case with the PureWorks products. 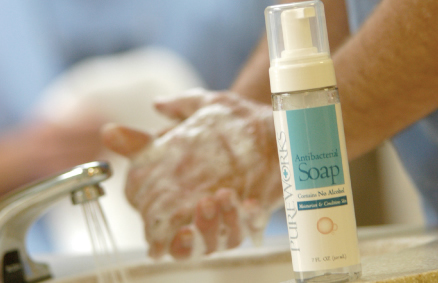 Our hands stay soft and germ free and I love how convenient it is. We went hiking this past weekend with our children and it was so great to be able to clean our hands and also disinfect the inevitable scratches and scrapes. I love the antibacterial lotion as much as the antibacterial foam. I keep them in my car, my purse and my diaper bag. I tell everyone I know about them. I don't know how I lived without them. Thanks for helping my family stay healthy. I would like to thank you for introducing me to your product. At the time I met you, I was suffering from 2nd degree chemical burns on my hands caused by another product. This product was claiming to be the best skin sanitizer on the market. After one day of use, my hands were very painful and turned bright red and began to peel from the burns. You talked me into trying your product even though I was very leery of any skin sanitizer after my experience with this other product. Within one day of use, the red had started receding and my hands were no longer so painful to use. I work in surgery and my hands are my work. With your product, I was able to work without pain in only one day. Within 3 days, the red was completely gone from my hands. I would recommend your product whole heartedly to anyone. Yes, our family loves PureWorks, especially me. I am a clean freak, and a mother of three active toddlers ages 4, 2, and 1. Before PureWorks, I had a sick child once a week. Since PureWorks came to our household, I recall only one sickness among my kids, for over a 3 month period. Now, we have PureWorks in our cars, purse, emergency backpacks and almost every place in the house. PureWorks has become such a big part of our life that my kids actually call it the "squirt protection". Our family (including two young kids) has been using PureWorks for eight months now and we have seen a significant improvement in our health. Literally, not one of us has had a cold or been sick in eight months. The benefits of PureWorks are priceless. I have seen a lot of products claiming to be so great and really don't do what they claim. This, to me, sounded like one of those products. My wife's cousin let us borrow a bottle to try out. I was hesitant, but my wife is germ-a-phobic so to speak, so I agreed. I took it to work, and there I saw a co-worker with a rubber glove on his hand. His hands were so dry that they were bleeding, so he put the glove on to not bleed on the high-end cabinets that we make. I let him take the bottle and try it on his hand. Two days later his hand looked pink, and was starting to heal. We decided to get him some Pure Works lotion to use. Within one week, he was completely healed. Needless to say, I saw it work, and now I am a beleiver. Copyright ©2010 - PureWorks, LC. All Rights Reserved.